The tank features an epoxy system designed by Sika and reportedly helps to reduce pollution in urban traffic. The tank features an epoxy system designed by Sika and reportedly helps to reduce pollution in urban traffic. It contains up to 320 liters is the same size as a conventional diesel fuel tank. 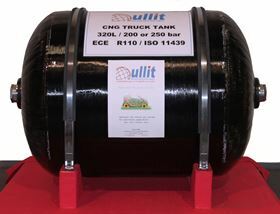 ‘This high-performance resin can be adapted to all design constraints, particularly for our very high-pressure hydrogen tanks, up to 700 bar,’ said Ullit founder and CEO Claude Hembert. ‘Ullit-Sika composites reduce the weight of the tank by a factor of four, a huge benefit when we estimate that one tonne saved on a truck saves four liters of fuel per 100 km in urban traffic,’ said Patrick Noirclerc, local expert composites at Sika Advanced Resins. The resin can reportedly withstand the cyclic pressurization loads on the filament-wound tanks. In combination with carbon fiber, the resin provides mechanical resistance for different tank shapes including those for vehicles running on natural gas. JEC World takes place from 12–14 March 2019 in Paris, France. This story uses material from SIka, with editorial changes made by Materials Today. The views expressed in this article do not necessarily represent those of Elsevier. Aliancys has formed part of a team developing new type of composite tank container that could reduce freight cost per trip by 5 to 10%. Hexagon Lincoln has received US DOT approval to operate its newest composite mobile pipeline product in the United States.